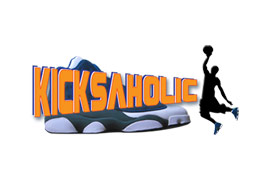 Kicksaholic is the dopest online kicks magazine. We feed your addiction daily by delivering the hottest kicks news from all over the world. Whether it be Nike, Air Jordan, Nike SB, Adidas, Puma, Reebok, Converse, or Bape, we’ll have it fresh, clean, and pretty with information on when and where to get it. We love kicks, and we know you do, too. Part of Plunder Media.